It is important to understand the difference between conventional stucco and the acrylic stucco system used by Best Toronto Stucco Homes. Conventional stucco consists of many layers of cement, sand, and lime mixtures placed on a wire mesh. A common problem with conventional stucco is cracking which occurs as a result of expansion and contraction of the cement as well as settling. It is possible to patch conventional stucco to "hide" the cracking but it is nearly impossible to match the colouring because the stucco tends to fade in sunlight. When this happens, you will be forced to paint it to have a consistent look. Most contractors will not offer a written guarantee on conventional stucco work. 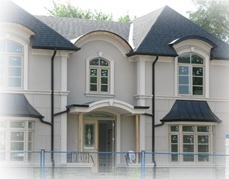 Best Toronto Stucco Homes uses a system of acrylic, or synthetic, stucco. This system incorporates a 2 in layer of insulations attached directly to the exterior of the home or commercial building. Allowances are made to ensure proper draining and for waterproofing purposes. A Fiberglass mesh is then embedded into an impact resistant base coat which is them coated with an acrylic finish. With acrylic stucco, you have more options as to the texture of the stucco. You also have the option of including seamless accent mouldings for your windows, doors, or other openings. You can choose from a huge selection of colours and if you decide in the future to make a change, acrylic stucco can also be painted to match your new style. All customers receive a 25 year warranty on materials as well as a 5 year warranty on workmanship.